Today, Friends of Simon Wiesenthal Center (FSWC) welcomed a class from a Toronto District School Board public school to learn about leadership in our Leadership 101 program. As always, the classes coming to us from this school are incredibly diverse and curious, and today was no exception. Teaching people in this age group is generally very rewarding as they have so much passion and energy that it becomes infectious to the FSWC educators, the supervising teachers, and even the parent helpers. FSWC Educator Emily had some really awesome participation in all group activities that really left the students with such a positive experience. As the saying goes, you can only get out what you put in, and today’s group of Grade 7s and 8s put in a ton of effort and passion. A key moment that Emily wanted to highlight is when she was discussing propaganda used by the Canadian government to promote residential schools. She asked the class if they were familiar with the term propaganda and if they could provide other examples. One student that Emily called on launched into a very detailed description of how Theresienstadt concentration camp was a form of propaganda for the Nazis to persuade Western reporters and Red Cross workers that the concentration camps weren't that bad - when really they were centres for mass murder. Emily was very impressed with his knowledge at such a young age and she told him as much. Emily was happy that FSWC's workshop was able to give this student a platform to talk about his own knowledge. It was a really good example for other students to remind them to be curious even when they are not in their traditional classroom setting. Today the Tour made its way to a secondary school in Brockville. The organizing teacher, a History teacher, was presented with the 2017 Arie van Mansum Award for Holocaust Education and Scholarship for his work at teaching students about World War II and the Holocaust for the past two decades. FSWC Educator Elena had a great day at a new stop and we got a lot of positive feedback from all of the teachers. 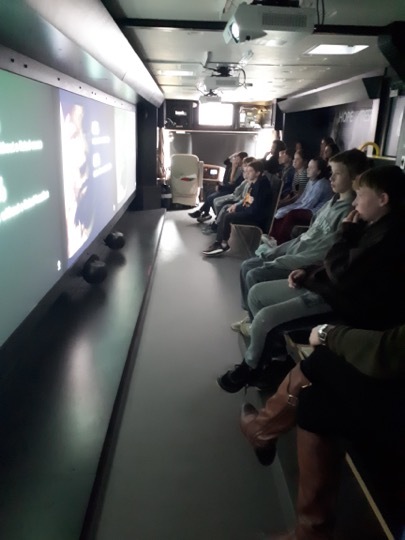 The students had some knowledge of the Holocaust, but most had not discussed it in class this year so Elena spent time going over the key details of the progression of the Holocaust during the onset of World War II. The Grade 7s we saw during period 2 were particularly inquisitive and Elena covered a lot of Hitler's early life and the origins of his ideology. Elena also had a lot of conversations around the residential school system in Canada because that was a particular focus of the Grade 11 Law class. Elena also talked about the atmosphere of suspicion and prejudice in wartime Canada. When describing the unfounded rumours of Japanese spies and the lessons we can learn from this example, one student asked Elena if she was "a liberal or a conservative?" Elena thought this was an interesting question and simply said that talking about history and human rights shouldn't be about politics and that it's important for people with different opinions to talk with each other openly and respectfully. FSWC presented its Lessons in Humanity program to members of the Edmonton Police Service today as well. The day was organized in part by Deputy Chief Greg Preston, a Compassion to Action alumni. 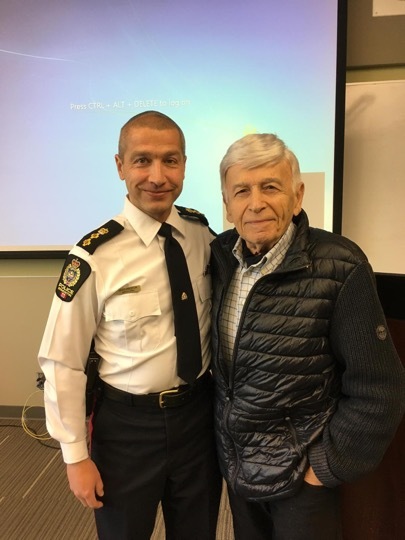 Deputy Chief Preston began the morning with an introduction about FSWC, our programs, Max Eisen, and his personal experience with Compassion to Action. He highlighted the importance of community action and how vital the role of Law Enforcement is to safety. FSWC Educator Daniella followed the introduction with an historical overview of the role of Law Enforcement during the Nazi era and the Holocaust. Daniella spent time discussing the different police units that existed during that time - the Gestapo (secret police), SS (protection squad) and Einsatzgruppen (mobile killing squads). The program then transitioned to antisemitism today, including recent hate crime statistics. 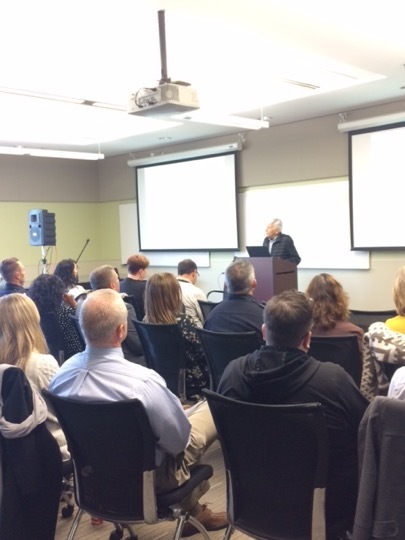 Following Daniella's presentation, Holocaust survivor Max Eisen spoke to the group for close to 2 hours and told his story of surviving Auschwitz. All programming was very well received, multiple officers came up at the end of the workshop to exclaim that they had learned a lot. Daniella also had a lengthy conversation with an officer who was part of the Edmonton Police Hate Crimes division. He told her how important this knowledge was and how they have been receiving more and more calls about hateful vandalism and incidents.